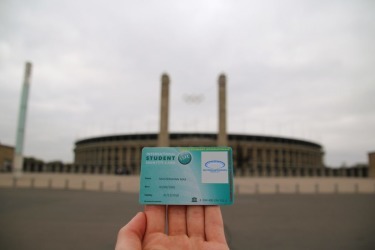 Today, Olympiastadion Berlin saw the book release of „Olympia in Berlin – Amateurfotografen sehen die Olympischen Spiele 1936.“ The official release, opened by author and historian Dr. Emanuel Hübner, publisher Alfred Büllesbach and the Olympic stadion’s CEO Timo Rohwedder was attended by various journalists. When thinking about the Olympic Games in Berlin in 1936, numerous images spring to one’s mind; pictures often resembling each other, serving only one purpose: to promote the image of a new, strong and united Nazi Germany. Hübner’s new book offers a change of perspective. By including 250 unpublished photographs, it shows the games from an amateur photographer’s point of view, allowing the reader to see behind the curtain of the official Olympic Games. Attention students! ISIC card holders get a free multimedia guide with a value of 4,- EUR: Go on a journey through the history of the grounds in 75 or 100 minutes – with mobile devices from Samsung incl. headphones. 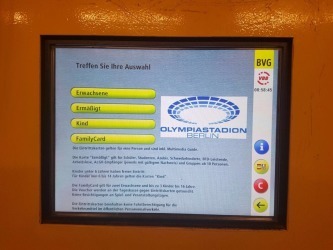 To all Berlin visitors and stadium fans – check this out: From now on tickets for sightseeing and guided tours for the Olympiastadion Berlin can be bought at the Berlin Transport Authority (BVG) ticket counters and shops.